A full bibliographic study of history of Montgeron's La vérité des miracles is yet to be written (see Kreiser, p.378 nt.). The first volume, which contains detailed accounts of the miracles of Saint-Médard, is generally considered the most interesting. It went to the press in late 1736 or early 1737. The first edition was printed in Urecht under the supervision of the abbé Nicolas Le Gros, closely followed by one clandestinely published in Paris - it was this edition which was destroyed in Hérault's bonfires. The book runs to over 900 pages and contains striking full-page engravings after originals by Jean Restout. The duc de Luynes reckoned that it had cost Montgeron over 1,000 livres to produce. In the Letter to the King which prefaces the book, Montgeron refutes the Archbishop of Sens and the supporters of Unigenitus, to say nothing of the Court of Rome and the Jesuits. 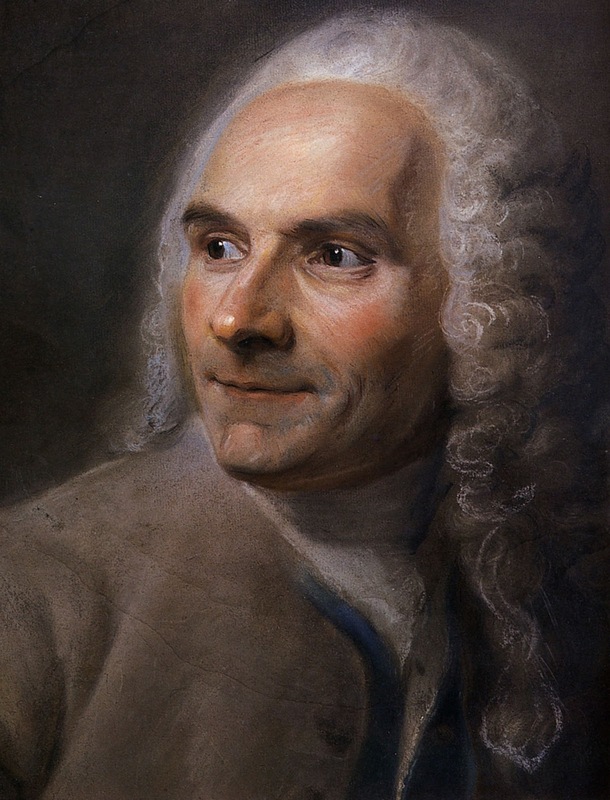 He underlines the divine origins of the miraculous cures of Saint-Médard emphasising how the miracles, by combating deism and doubt, "rendered glory to God". The miracles validated the orthodoxy of appellant teachings and God's disapproval of the Constitution. There follows the 32-page account of his own"miraculous conversion". The book was expensively produced. The copies intended for the King, the duc d'Orléans and the Premier Président were sumptuously bound in green morocco leather by the renowned Derome and Pasdeloup. The copy intended for the King, with its gold embossed royal crest, still exists in the collection of Bibliothèque de Port-Royal. It was left by Cardinal Fleury to his nephew, the bishop of Chartres, and bought on his death by Louis Adrien Le Paige, whose collection passed to the library. (Kreiser p.283): It was on shown in 2010 at the Bibliothèque de l’Arsenal as part of the exhibition La Bastille ou l’enfer des vivants. I haven't managed to find a coloured picture - the black and white illustrationright is taken from Auguste Gazier's 1912 article. The most striking feature was the set of fine engravings after drawings by Jean II Restout. 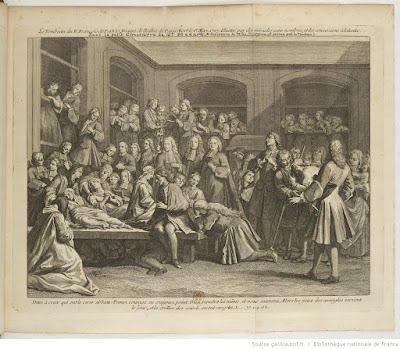 The circumstances under which Montgeron engaged Restout are not known but he was a natural choice: according to Christine Gouzi, Restout's images were behind many of the early engravings of the diacre. Montgeron may have come into contact with him through Jérôme-Nicolaswho in all probability commissioned Restout's portraits of his brother and the abbé Tournus. 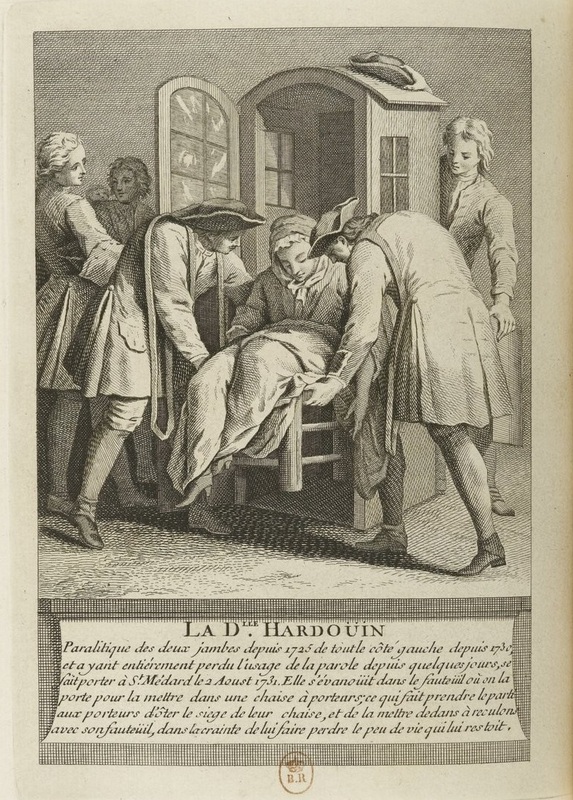 Between 1736 and1740 Restout completed in all thirty illustrations for the first two volumes of La vérité des miracles. 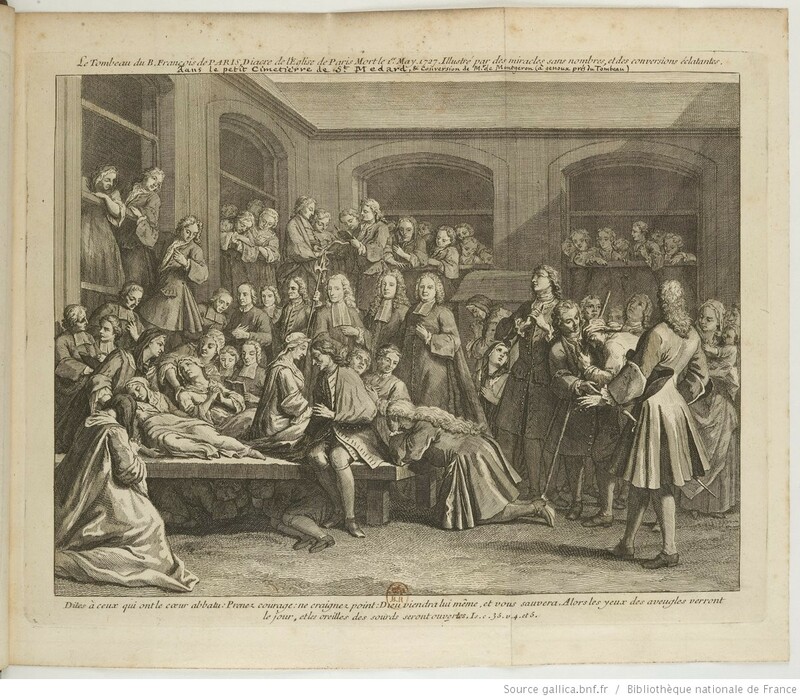 The pictures were entrusted to different engravers in Holland and France - there are at least three variations of each image; several well-known engravers can be identified, among them Pieter Yvert, Jacques-Nicolas Tardieu and Charles-Nicolas Cochin fils. In 2013 an exhibition dedicated to Restout's illustrations was held at the museum of Port-Royal des Champs. The museum holds a set of original drawings, - sixteen were acquired in 1980 and two more in 2012. A further four were lent by the Musée des beaux-arts in Rouen. 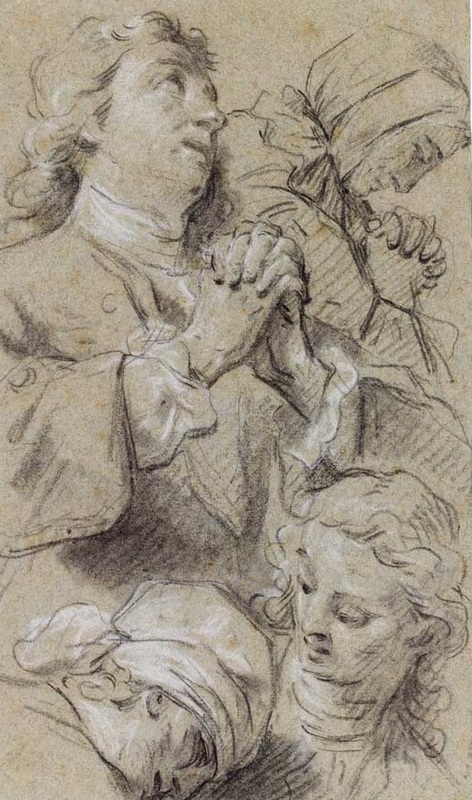 They consist mainly of preliminary studies for details of the compositions and are charcoal, with white chalk highlights. 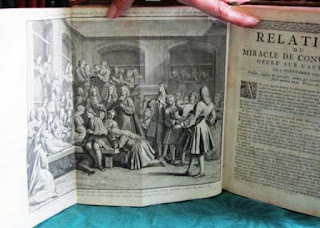 Engravings after Restout in volume I consist of the frontispiece, showing the diacre in prayer; the fold-out page of Montgeron's conversion at Saint-Médard; and eighteen full-page engravings grouped in pairs, depicting each individual before and after their miraculous cures. Auguste Gazier (p.120) testifies to the accuracy of the depiction of the cemetery at Saint-Médard, which he himself visited before its destruction. In this image Restout conceived a decorous and relatively subdued gathering of the devout; there are several recognisable portraits of well-known Jansenists - the magistrates Pucelle and Titon, the Oratorian Degennes, the abbés Tournus and Levier. The pairs of plates have the same balance of factual depiction and spiritual edification. The subjects are in some cases cases also clearly portraits; the features of the Demoiselle Thibault, for instance, can be recognised in both the before and after pictures. The details of the various bodily afflictions are carefully delineated and differentiated, sometimes to startling effect - see Demoiselle Thibault's dropsy swollen feet. Fascinating too are the minutely observed details of sedan chairs and the like, and of relatively modest 18th-century dress. Jean-Robert Armogathe, "A propos des miracles de Saint-Médard : les preuves de Carré de Montgeron et le positivisme des Lumières".Revue de l'histoire des religions, tome 180(2)1971. p. 135-60. 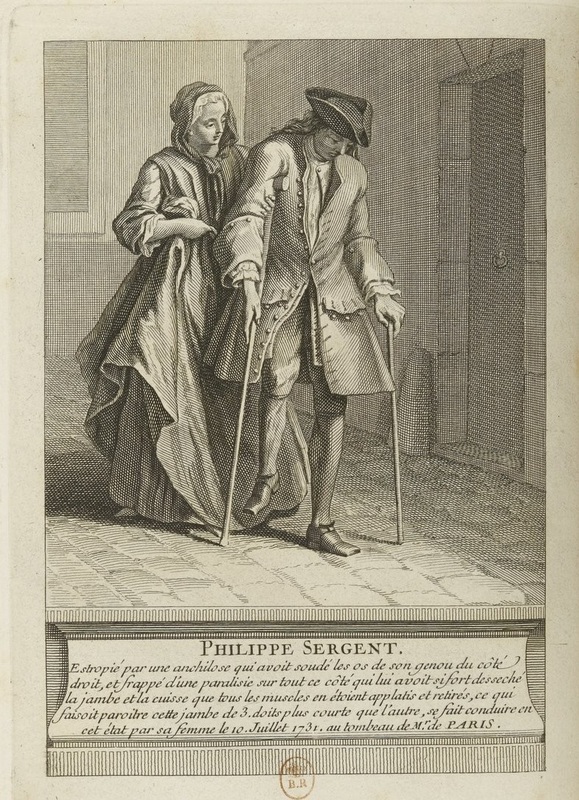 Gallica reproduces a complete set of plates from Montgeron's work. 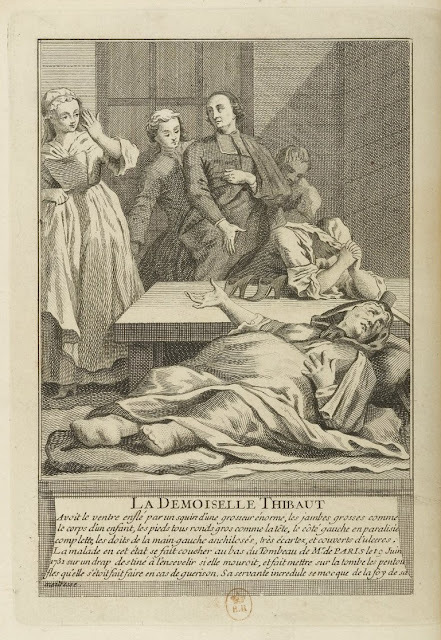 Auguste Gazier, "Jean Restout et les "miracles" du diacre Pâris (1737)" Revue de l'art chrétien (1912) p. 117-30.